Extracorporeal shock wave therapy, or ESWT, is a reasonably new treatment for painful plantar fasciitis / heel spurs / heel pain which is becoming more popular with recent improvements in the delivery device. ESWT delivers targeted shock waves to the painful area using a hand held ‘gun’ that taps the inflamed tissue. The shock isn’t an electric shock, it is a physical blow. Shock wave therapy is thought to work by causing micro trauma (or tiny spots of damage) to the thick gristle-like tissue that makes up the plantar fascia band. We usually reserve using shock wave for plantar fasciitis that is chronic – more than three months in duration. The body will come in and repair this new, acute injury and in doing so brings more blood flow and repair cells to the chronic injury where your body has ‘given up’ its repair effort. It has proven useful to also shock the calf muscles and Achilles Tendon to treat heel spurs as these two structures are highly interdependent. This is done using a different shock head that goes deeper and broader than the one used on the less fleshy parts of the feet. Like many medical procedures, there are pros and cons to the use of shock wave therapy. Our Brisbane podiatry clinic completed a ten patient trial run in September 2015 with the unit before we decided to incorporate it into our practice. The results were better than we had anticipated with very stubborn, long term conditions responding quite quickly. We also found good success with Achilles Tendon issues. The potential downside to treatment is that it can be uncomfortable at the time of delivery and it can increase pain for a couple of days after. So far, we have found that patients tolerate quite different levels of stimulation on the heel and the delivery of ‘taps’ can be dialed up or down accordingly. Application to the calf is generally quite pleasant. We are currently only using the treatment on conditions where it has been present for more than three months. We don’t think that it will be as useful on more recent pain but will learn more as we go along. The treatment is often done three or four times at an interval of 4 to 7 days apart. The cost of the sessions is ~$85 and, as we are podiatrists, the treatment attracts a health fund rebate between $20 – $50 depending on your level of cover. Item numbers for shockwave therapy are F014 and F145. There is both a high-energy and low-energy form of ESWT. The Brisbane Private hospital has a lithotripsy machine that delivers high powered shock to the bone of the heel. This is a much more intense treatment which causes more concentrated therapeutic damage to the tissue. It may be done under local or general aneasthetic. This treatment was originally used for breaking up kidney stones. We have used this as our ‘treatment of last resort’ previously with reasonable results but had preferred steroid injections ahead of this treatment due mostly to the pain of application and the cost of the treatment. You can visit their website here to learn more. At this time, we are recommending low intensity shock wave plantar fasciitis ahead of steroid injections for plantar fasciitis at our Brisbane podiatry clinic. This is for two main reasons. Although there is some chance of increased pain for a few days after the treatment, there is no systemic affect on the whole body and the treatment is a walk-in walk-out one. Also, it seems likely that the long acting corticosteroid would be forced out of the tissue if shock wave was used after an injection, thus moving it away from the site of action. Naturally, with advances in technology come different ways in which it can be used in the treatment of ailments and persistent problems. Where podiatry is concerned, shock therapy for plantar fasciitis has emerged in recent years as a possible treatment method that offers relief from chronic pain suffered from this condition.Here at Walk Without Pain podiatry clinics, our team of specialist podiatrists have adopted this new approach as a means to treating those that have suffered from plantar fasciitis for three months or more, seeing as the best results are achieved in more long-term cases. With 4 clinics in Brisbane, here at Walk Without Pain, we endeavour to bring the latest treatments and solutions to those in our locale. Podiatry can be considered a luxury to many people given the expensive rates that are associated with such medical treatments, and unfortunately, this means that those in our community choose to suffer on with their conditions instead of seeking out the help that could enable them to live their life to the fullest. As such, our goal is to offer an exceptional standard of treatment and care that is more affordable than our competitors. In order to make treatments such as shockwave therapy accessible to Brisbane natives, our alliances with Medibank Private and BUPA ensure that our patients save a lot of money by choosing our services. What’s more, given that HICAPS rebates can be processed on-site at the time of your appointment, this alleviates some of the financial burdens and we hope will encourage more people to get the kind of treatment and help they deserve. Extracorporeal shock wave therapy (ESWT) is delivered via a handheld ‘gun’, which targets the problem area directly. It is a non-invasive form of therapy and feels more like a blow, rather than an electric shock. This prompts a response from the body, which sends more blood to the affected area to begin the process of recovery. The treatment is usually completed over a number of sessions. While some patients may not welcome the sensation, it is a much-preferred option compared to surgery, which leaves patients at risk of continued pain and opens them up to infection or complications with the wound. As such, it is an efficient and safe way of targeting the issue without having to bring about additional worries or concerns that could lead to further expense. 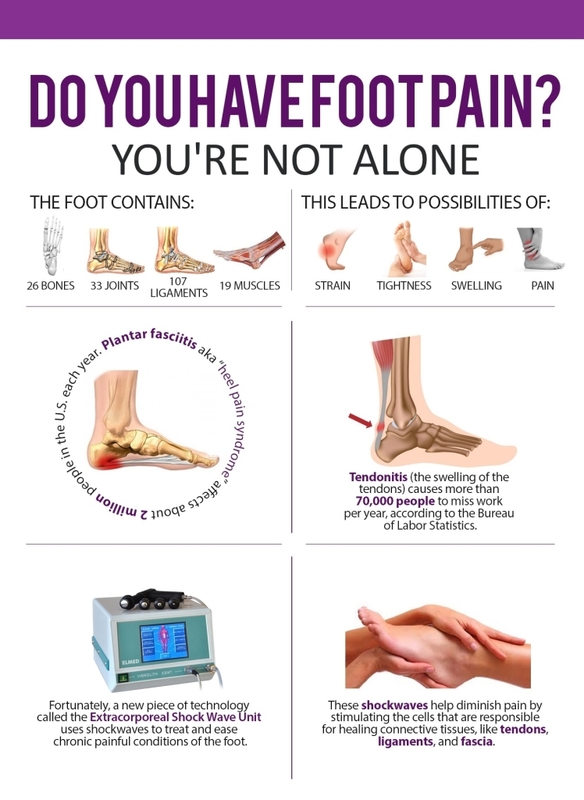 While ESWT treatment for plantar fasciitis is a relatively new treatment, those who have been suffering from this condition for a long time, or who have tried the traditional methods to no avail are encouraged to not lose hope and explore the possibilities that this might offer. At Walk Without Pain, we are a team of lifelong learners. As such, we are committed to understanding and improving our delivery of this treatment and all other treatments available at our clinics. Each of our doctors undergoes 50 hours training each year, and between us all, we have seen every condition and found effective solutions. As such, we invite those that are considering shock wave therapy for plantar fasciitis to book an appointment at one of our 4 clinics so that together we can work toward eliminating that persistent problem, and empower you to focus on living your best life.